2 Apr 1849 : As a result of the Second Anglo-Sikh War, the East India Company forms the Punjab Province after annexing Punjab from the Sikh Empire. Lahore is the capital of Punjab. 1864 : The summer capital of India becomes Simla. 1873 : The summer capital of the Punjab Province becomes Murree. 1876 : The summer capital of the Punjab Province is moved to Simla. 9 Nov 1901 : Frontier districts beyond the Indus bordering Afghanistan were separated from Punjab and made into the North-West Frontier Province with Peshawar as its capital. 12 Dec 1911 : Emperor of India, George V announced the movement of the capital of India from Calcutta to Delhi during the Imperial Durbar of Delhi. 10 Feb 1931 : New Delhi officially inaugurated as the capital of India. 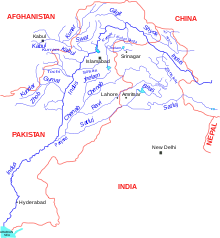 14-15 Aug 1947 : Partition of India resulted in the division of Punjab between Pakistan and India. Lahore is the capital of West Punjab while Simla becomes the capital of East Punjab. Delhi ceases to be a provincial division of Punjab. 26 Jan 1950 : East Punjab renamed as Punjab. 1 Nov 1956 : PEPSU merged into Punjab. 1960 : Chandigarh becomes the capital of Punjab. 1 Nov 1966 : Hindi-speaking districts of southeastern Punjab separate to form the state of Haryana. Chandigarh becomes a union territory and the capital of both Punjab and Haryana. Northeastern districts ceded to the Union Territory of Himachal Pradesh with Simla as it's new capital. 25 Jan 1971 : Himachal Pradesh becomes a state of India. پەنجاب به ( زمانی پەنجابی : ਪੰਜਾਬ) ویلایەتێکه له باکووری ڕۆژاوای هیندستان که له ڕۆژاواوه لەگەڵ پارێزگای پەنجابی پاکستان، له باکوورەوە ویلایەتەکانی جاموو و کەشمیر، له باکووری ڕۆژهەڵاتەوە هاریانا، له باشوور و باشووری ڕۆژهەڵاتەوه ڕاجستان باکووری ڕۆژاواوه هاوسنووره. پانتانیی گشت پەنجاب بەرابەره لەگەڵ ٥٠،٣٦٢ کیلۆمەتر دووجار، له ساڵی ٢٠٠٠ی زایینی دا ڕێژەی دانیشتوانی ٢٤،٢٨٩،٢٩٦ کەس بووه. ناوەندی ویلایەتی پەنجاب شاری چەندی گەره که بە شێوەیەکی سەربەخۆ بەڕێوەه دبرێ، هەروەها وەکوو ناوچەیەکی هاوبەش ناوەندی ویلایەتی هاریاناشه. شارەه هەرەه گرنگەکانی ئەو ویلایەته بریتینه له لودیانا، موهالی، ئامریتسار، پاتیالا، جەلەنده‌ر . وشەی پەنجاب تێکەڵێکه له دوو وشەی فارسی (پنج)= پێنج و (آب)= ئاو پێک هاتووه، به مانای وڵاتی پێنج ئاوەکه. ئەو پێنچ ڕووباره بریتین له ڕووباری بیاس، ڕووباری جێهلۆم، ڕووباری چێناب، ڕووباری ڕاوی، ڕووباری ساتلۆج. ئەم پەڕەیە دواجار لە ‏١٢:٤٤ی ‏٢٥ی ئابی ٢٠١٨ نوێ کراوەتەوە.